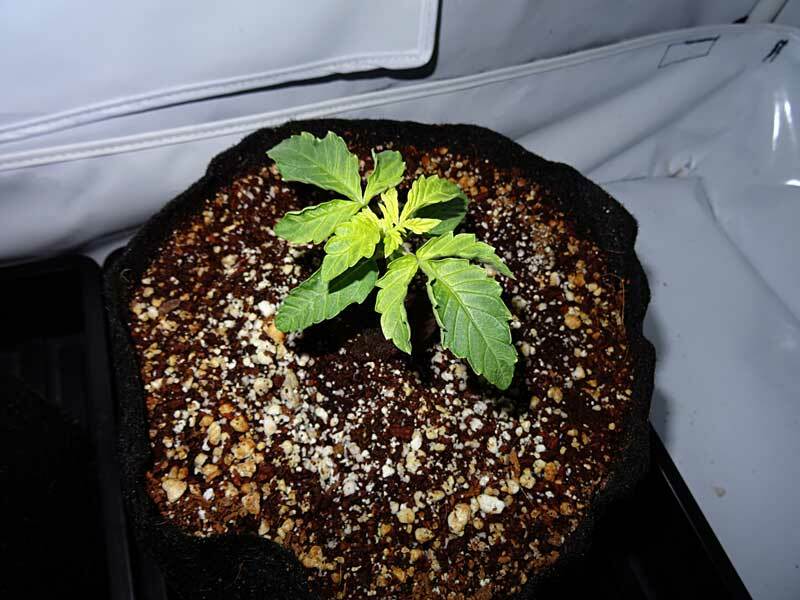 Problem: A cannabis iron deficiency is usually seen first on bright yellow new leaves, and the symptoms of a cannabis iron deficiency can sometimes appear alongside other cannabis nutrient problems or deficiencies. An iron deficiency is usually caused by problems with pH, though sometimes a cannabis iron deficiency can be triggered by a stressful environment and may clear up on its own after the period of stress is over. The bright yellow (almost white looking) color on new growth is the signature sign of an iron deficiency. Eventually an entire leaf can become green and relatively healthy looking, even though it started out completely yellow from an iron deficiency. The ability of yellow leaves to eventually turn green is another signature of an iron deficiency, because for most other nutrient deficiencies any yellow leaves can’t truly turn green again. A cannabis iron nutrient deficiency can look similar to a magnesium deficiency, but an iron deficiency will affect newer/upper/inner leaves, where a magnesium deficiency affects older/lower leaves. The following severe iron deficiency was actually caused by an outdoor grower using too much pure chicken manure as a fertilizer. Any time you use manure to fertilize your plants, remember a little bit goes a long way! Chicken manure tends to raise the pH of soil, which is one of the prime triggers of an iron deficiency. In addition to changing the pH, the high level of nutrients contained in chicken manure may have interfered with iron uptake by the roots, causing further iron lock-out. Immediately after adding chicken manure and watering, the plant started producing bright yellow, almost white leaves that immediately dried up and died from the damage. Even though this plant was showing the signs of an iron deficiency, the iron was available in the soil – the problem was that the plant just couldn’t get access to the nutrients due to nutrient lock-out conditions. In this case, grower needs to dig up the manure (since that is the real cause of this problem) & replant with good soil. Note: Sometimes a cannabis iron deficiency (like all nutrient deficiencies) can be triggered by stressful conditions, and the plant may recover on its own after the period of stress is over. Easily the most common reason growers will see an iron deficiency is if the pH at the roots is too high. Iron tends to get locked at at higher pH levels, especially when the pH is above 7.0, and iron deficiencies are more commonly seen in soil or coco coir than in hydro. If you suspect your growing cannabis plant has a iron deficiency due to too-high pH, flush your system with clean, pH’d water. This will remove any nutrient salts that may be affecting the uptake of iron and help restore pH to the proper levels.. Learn how to manage your pH for growing cannabis. The truth is, most cannabis growers don’t need to add more iron in response to an iron deficiency! In fact, most growers have actually already given plenty of iron to their cannabis plants since it is found abundantly in most tap water. If you’re using quality soil or cannabis-friendly nutrients, you probably don’t need to worry about adding more iron. Iron deficiency symptoms caused by true lack of iron are more likely to appear when a grower is using heavily filtered or reverse osmisis (RO) water to feed plants since any iron has been removed. There are other nutrient problems that can trigger the symptoms of an iron deficiency, for example problems with with calcium and magnesium, or an excess of copper can all lead to symptoms of an cannabis iron deficiency. If you suspect you have a iron deficiency even though the pH is correct, or if you believe your system is truly lacking in iron, you may want to consider flushing your system with clean, pH’d water (if on schedule, you can do this alongside a dose of your regular nutrients) and add a supplement that contains Iron, Calcium and Magnesium. 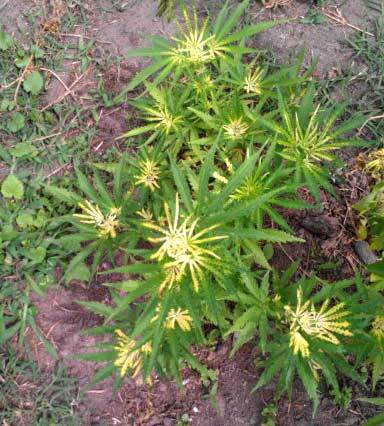 Cannabis loves Calcium and Magnesium, and they work hand and hand with Iron. A Calcium-Magnesium supplement (often called “Cal-Mag” even though they also include iron) can help prevent all of these deficiencies from appearing. Cal-Mag products are suitable for Hydro, Coco Coir and Soil (not organic, though). This may be a great choice because it also contains extra calcium and magnesium, which are deficiencies that are relatively common for cannabis, and often happen alongside an iron deficiency. 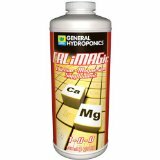 CaliMagic by General Hydroponics is the calcium, magnesium, and iron plant nutrient supplement that we use, though pretty much all other Cal-Mag products will work just as well for growing cannabis. 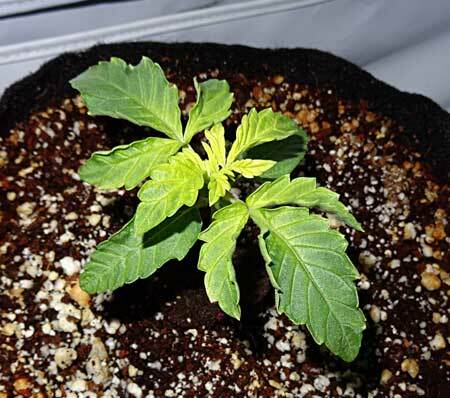 Iron deficiencies can show up with the plant is having root problems or if the plant is overwatered, even if the pH is right and the iron is there. Proper watering practices help plants grow healthy and avoid a host of problems! After going through all the above steps, watch to make sure that the iron deficiency starts to clear up within a week or so (try to be patient since iron moves relatively slowly through the plant). The yellow leaves from before may not recover completely, especially if there was a lot of damage, but when new growth is coming in green, you know you’re good to go!